Our Redwood wine racks allow you to enjoy the customized look of premium clear redwood without the custom price. Combine and mix to develop your own personalized custom home wine cellar. All wine cellar and rack components are 72" high, 8 3/4" deep and come in easy to assemble kits which screw together. To maximize the depth of your space, two components can be attached with our special braces. Aficionados appreciate this look of refinement made affordable. 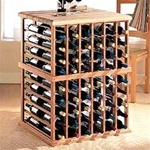 The Traditional Redwood wine rack collection is designed to accommodate wine bottles that are 2 ¾” to 3 ¼” in diameter. Structurally designed to accommodate additional wine storage above racking. All hardware is included. The 21 rows x 3 columns is 72"H×13½"W×9"D and holds 63 bottles. Rack forms a smooth 90 degree transition between walls. The Redwood Kit is 1 column wide x 7 rows high, including the case on top cradles 84 bottles at 72"H×15¾"W×9"D.
Rack is 1 column wide x 3 cubes high. Each cube has 4 quadrants holding 10 btls for a total of 40 btls. Free Freight! Table top and glass rack combined to make a useful and elegant display of your wine and stemwares at 26 width. Rack is 3 columns wide x 16 rows high and cradles 48 magnums. Solid Diamond Cubes are 1 column wide x 3 cubes high. Each cube has 4 quadrants holding 10 bottles for a total of 40 bottles. With a case stored on top, this wooden wine rack holds 132 bottles. Dimensions 72"H×24¼"W×9"D. Assembly required. Ships in 5-10 business days plus shipping time. Corner Shelf at 72"H×8¾"W×9"D. Assembly required. Adding a crown, base and toe kick to your Redwood kits offers a customized look without the custom price. Rack is 1 column wide x 9 rows high, including the case on top, for a total of 108 bottles at 72"H×24¼"W×9"D.
Elegant tasting table for your wine cellar or any room to cradle 108 bottles. Crafted with clear redwood. The Redwood Bottle Grid wine rack was developed to focus on maximizing individual wine bottle storage capacity at an economical price point. This sturdy wine rack is manufactured out of our popular Premium Redwood, and is designed to hold 115 wine bottles in an individual format. Included with this wine rack are mounting brackets necessary for securing the rack to your wall. Please note that this product requires assembly, and that the rack was designed to be secured to the wall.